As we all know, our pipes and smoking utensils can get caked up with resin with repeated use. This sludge taints the taste of our weed, and in worst case scenarios, can melt and drip into our mouths while smoking. Yuck! In the following tutorial I’m going to show you the best methods and maintanance for your pipes so you can avoid the dreaded brown ball on your tongue. Be creative. All pipes are different and require special cleaners. 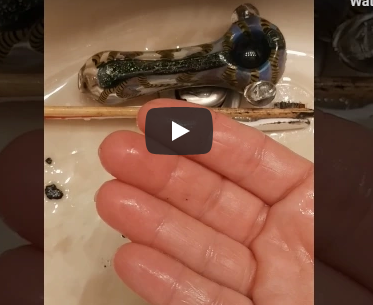 Be careful with glass pipes to make sure that your cleaning rod doesn’t break the glass! Wire clothes hangers are easily accessible and can be fashioned into a variety of shapes to help scrape off the brown guck. There’s also long wooden sticks that are sold at most grocery stores, they’re basically like jumbo toothpicks. These are great for glass pipes since they are softer. Once you’ve found your scraping device , you’re going to want to get off the majority of that resin simply by scraping and then cleaning off your rod with a rag or paper towel. Soak your pipe in rubbing alcohol overnight. Then in the morning, dump our that alcohol, and then clean off with a rag or paper towel. Then fill up your pipe again with rubbing alcohol, and then add a ton of salt! Yes, that’s right, salt, it’s going to act like an abbrassive and help scrub the sides of the pipe or bong. This works especially well for glass pipes and bongs where there are areas which are impossible to get to with a scraper.